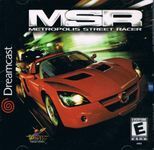 "Metropolis Street Racer or MSR is a racing game for the Dreamcast. It was developed by Bizarre Creations, and published by Sega. The game was originally intended to be a Dreamcast launch title in Europe and North America, however, due to numerous delays it was not released in Europe until March 2000, with a US version following in January 2001. Development of a Japanese version was started, but was never released. Metropolis Street Racer is notable for introducing the "Kudos" system (whereby players are rewarded for racing stylishly as well as quickly) into video games, and for its detailed and accurate recreations of the cities of London, Tokyo and San Francisco. Music for the game was composed by Richard Jacques, and delivered via nine fictional radio stations (three for each city), similar to the Grand Theft Auto series. The day/night time spectrum during game play is realistic, in that the game uses the internal clock of the Dreamcast to calculate the present time in each city. Play at 8AM in England, for example, and the San Francisco races will all be at night (12 AM). A selling point of MSR was the large number of tracks available (262 in total), created by blocking off certain areas of the city to lead the player around specific roads and paths. However, only a small number are available at the start of play and most are unlocked by playing through the single player mode. Many of the concepts used in Metropolis Street Racer were reused in Bizarre Creations' follow-up racing series Project Gotham Racing on the Xbox." Source: Wikipedia, "Metropolis_Street_Racer," available under the CC-BY-SA License.